make it work. 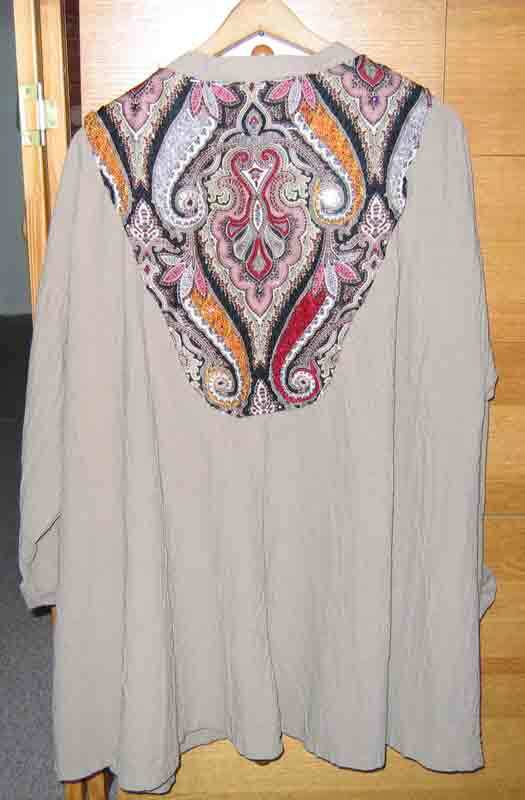 It’s taken a lot of fussing and fiddling, but here it is–the embellished sections pinned to the jacket. During this period while I’m stitching the embellishment for my jacket, I’m also continuing my study of particle physics–reading more books on the subject. Two of those books are due back at the bookmobile on Friday, and I want to scan some passages before returning them. (I’ve already bought two other physics books I’d borrowed and decided I needed to own, and I’ve ordered two more from the library. Today I found some fantastic interviews on YouTube, but they’ll still be there after I’ve finished my jacket.) Anyhow, this is just a quick post to stay in touch. I’m nearing completion, and so, of course, I thought of something else I could add. So I decided to try embellishing my stitching of the petals and I really like the effect. Now I have to embellish all the petals. 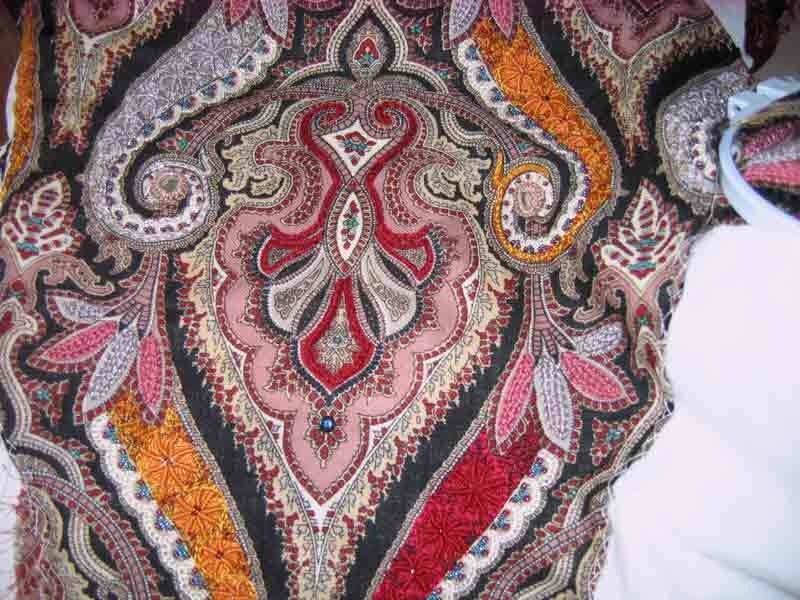 And on this section, there’s more beading to be done–the centers of the spider webs and the central motif. Maybe I can finish those parts today, depending on how long it takes me to scan pages of the book I have to return Friday. Yes, I’m still having fun, and I’m having fun thinking about why this is fun for me. That I’m listening to Bach while stitching doesn’t diminish the fun. First, I haven’t been posting because I’m saving the time for stitching. I’m not even keeping up with everyone else’s blogs. I’m not even reading the newspaper. I’m using all my “active” time for stitching. Now to the point of this post. 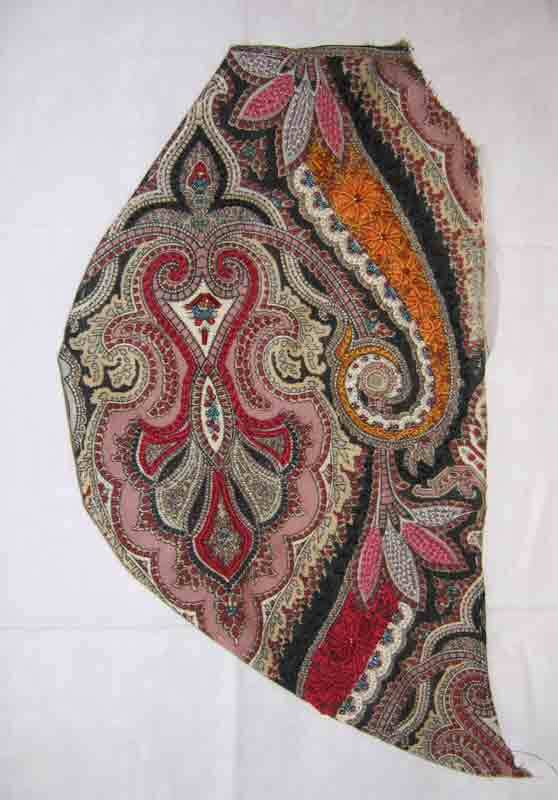 In the solid part of each paisley, I have used five different shades of the color. 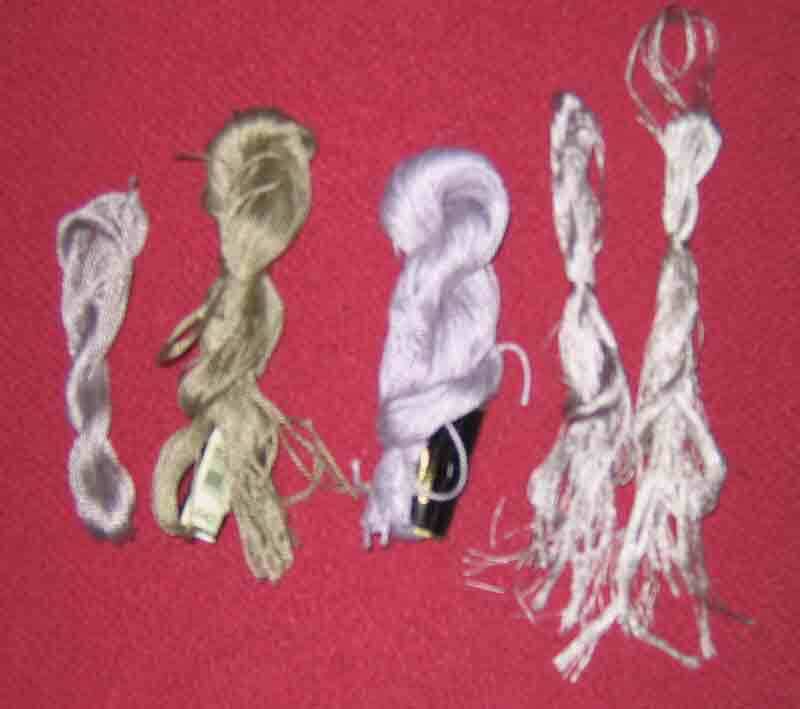 The dominant color is the thread used for the five whipped spider webs. 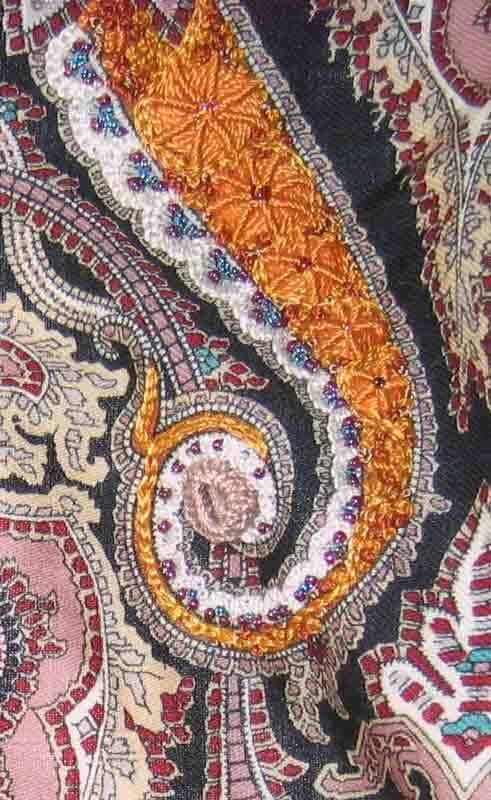 The chain stitch curved lines are worked in silk threads. Then the rest of the shape is filled in with mostly French knots in three different threads. Now, you may remember my anguish at not being able to match the perfect gray thread I wanted to use. This was all I had; it was unidentified; and I was unable to match it. I bought lots of gray threads–cottons, silks, rayons, floss, and pearl. None was right, and I was afraid I would not have enough of the “perfect gray.” What if I got to the last bit of stitching and ran out? Well, that hasn’t happened, thank goodness. I have enough of that thread to finish the last padded petals. Here are the five gray threads I’ve used. 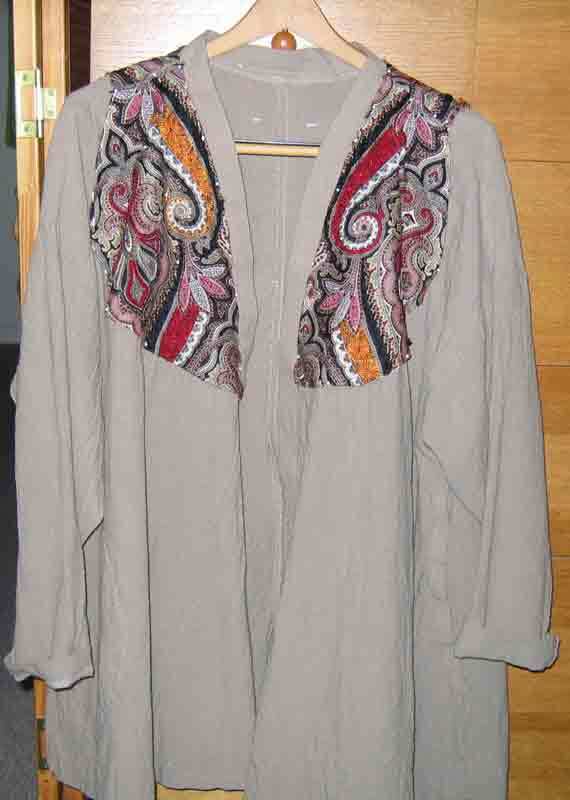 And here’s how the gray paisley looks. Here’s the question. I did not create this design. I did not choose the color scheme; I just tried to match the existing colors. I’m using a limited variety of stitches and most of the stitching is done using ordinary #5 cotton pearl. I’m repeating the same stitching over and over again. So why am I having so much fun? 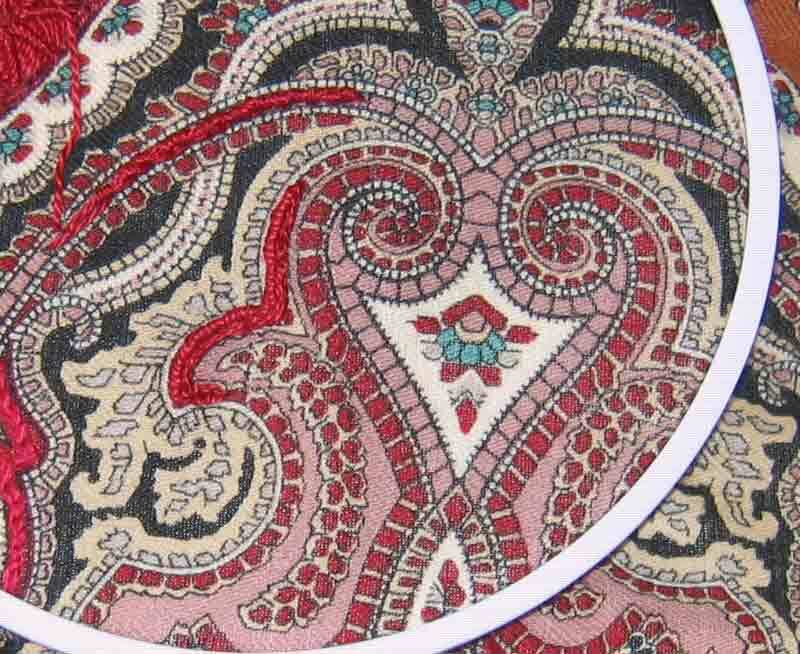 Although I’ve been making steady progress on my jacket embellishments, I haven’t posted them because each paisley is stitched like the others. I’ve never done such repetitious stitching, and I’m enjoying it. But there has been a bit of learning along the way. To be able to stitch all the sections near edges, I’ve had to add some old sheeting fabric to allow for hooping. 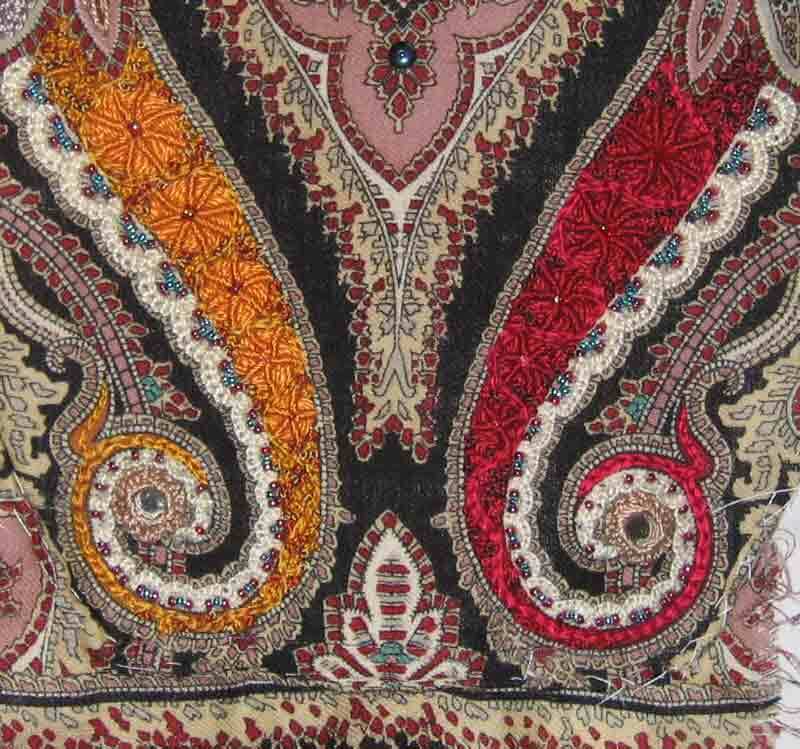 After I had stitched all the paisleys on the back section, I noticed that the curving chain-stitched line stood out visibly in the red paisley, as I wanted it to. 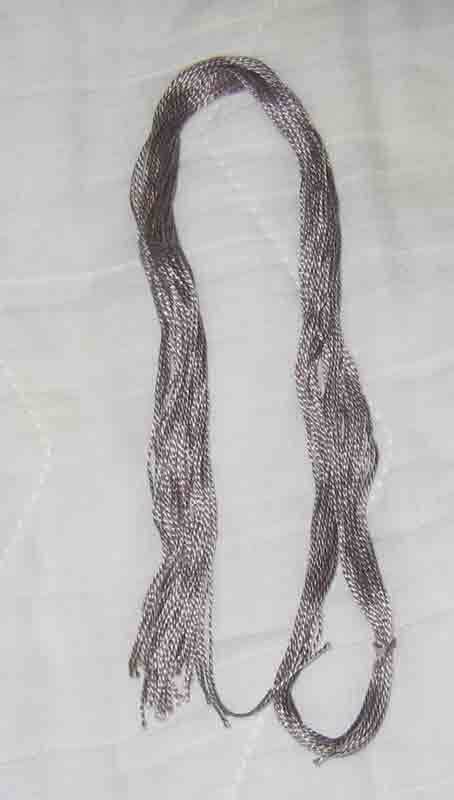 This chain stitching was done with one of the silk threads I had dyed. But the gold chain stitching disappeared into the surrounding stitching. So I stitched over it with a single strand of bright gold silk floss–very fine. Now it can be seen. I’ve stitched over the central large red shape four times, twice on a practice cloth, because the first attempt was not acceptable. 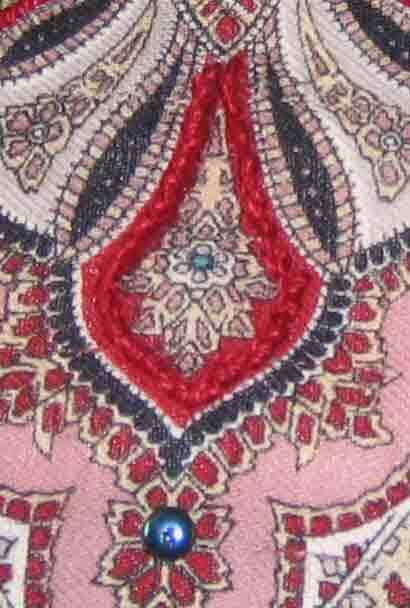 This is stitched in Portuguese knotted stem stitch. Not good enough. I tried practicing Portuguese knotted stem stitch on a fragment I’ve been using as a practice cloth. Still not good enough. So, after reviewing some stitch books, I tried the heavy chain stitch. Okay. That was it. Here it is on the back section for the jacket. 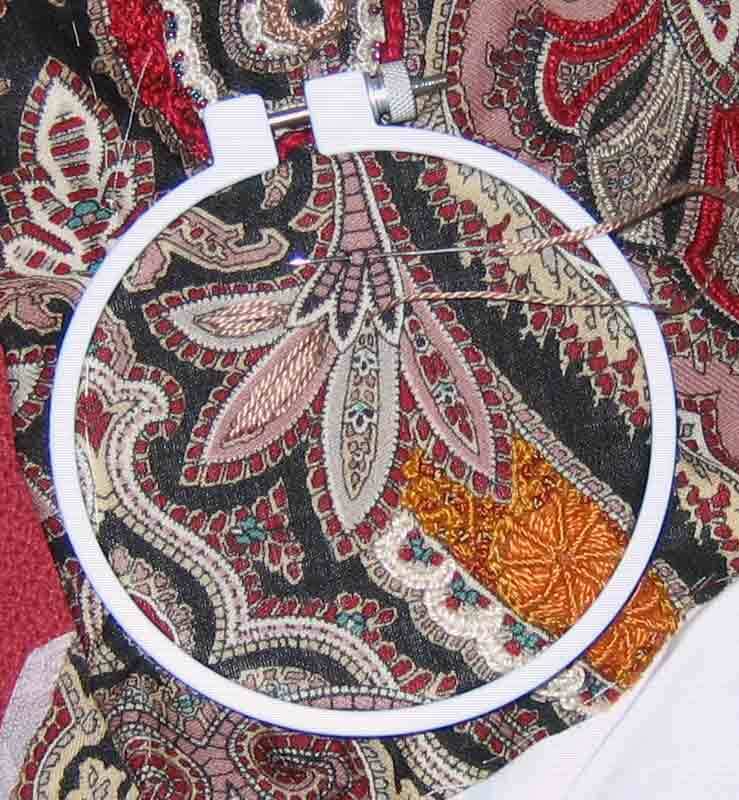 Instead of cutting the thread of the offending Portuguese knotted stem stitch, with a tapestry needle, I removed each knotted stitch–twenty minutes. See what I mean about fussing and fiddling? And now I have to do the same thing with the stitching done on the two front sections. So there you have it–lots of fiddling and fussing to get it right. And I’m actually having fun! I’ve been making steady, though slow, progress on the embellishing of my jacket. There have been more experiments on practice cloths, and the arrival of the final (yes!) order of threads. No matter what, I am going to finish with the materials I have on hand. Here is a shot of the first finished section, ready to be attached to the jacket. That shot was taken by flash. This one was taken in daylight on my windowsill. 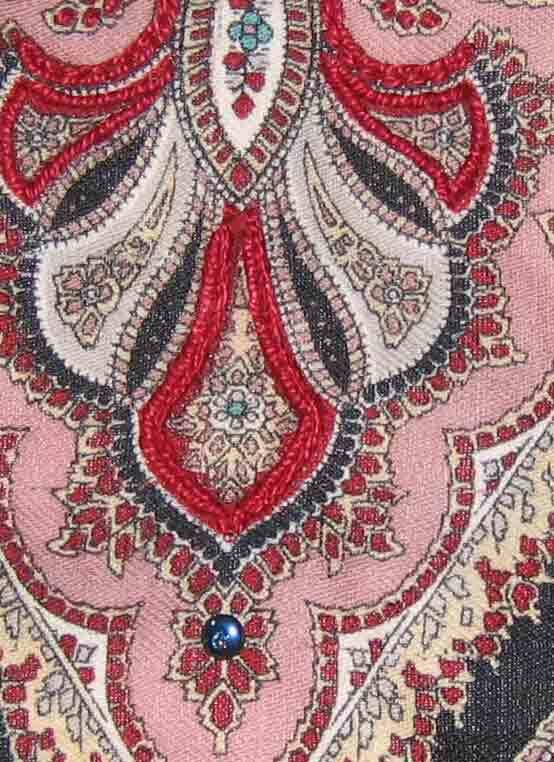 I hope that between the two of them, by clicking on the images twice, you can see the beads and various stitches. The pink and gray petals, or whatever they are, were first padded with #5 cotton pearl long stitches, then covered with detached buttonhole, also in #5 cotton pearl. I’ve made considerable progress on other sections, too. But now I’m in real conflict about how I spend my time. Since taking The Teaching Company course in particle physics, I’ve read four physics books and I have four more beside my recliner right now, plus another one on modern science in general. And, I want to go through The Teaching Company course on string theory. The more I’ve learned, the more I want to learn, and the more I feel compelled to explain why it matters to me, which means writing an essay to figure it out. The books, except one, are on loan from the library via Inter-Library Loan, thus I have a time limitation on them. They can’t be renewed. I suppose if necessary, I can buy the books. We’ll see. Meanwhile, I am torn every day between wanting to be stitching on my jacket, eager to see how it’s going to look finished, and wanting to study physics and write about its significance for me personally. What’s more, on my desk are four books on Elizabethan embroidery as reference for my next project! Do you also feel conflicted about how you spend your discretionary time? Do you feel, as I do, that there are always more things I want to make and to learn than I can possibly ever have the time for? I think this project has been a struggle for me because it wasn’t fully planned out in advance. Once I got the idea of using the scarf, I just went ahead, cutting and improvising, not thinking it through step-by-step, not anticipating possible problems and planning ways of dealing with them. 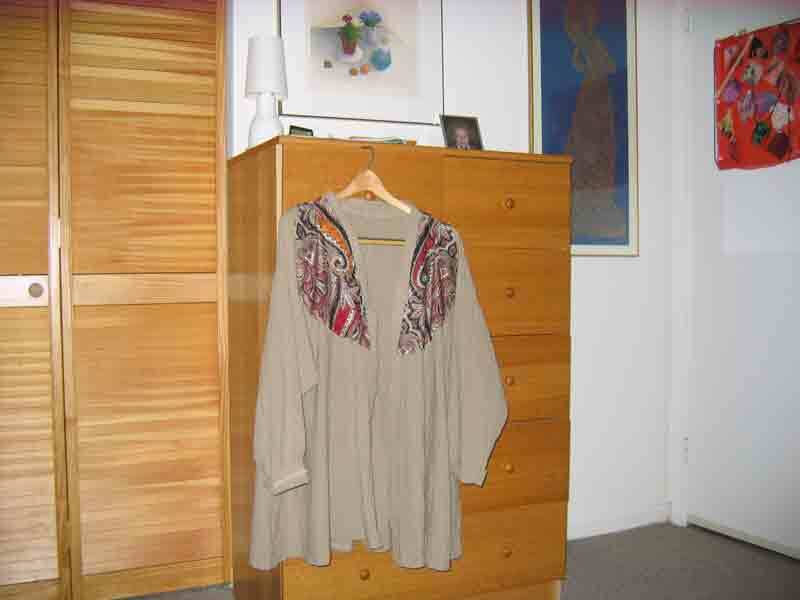 After I had decided to use the old scarf as the basis for embellishing the jacket, and after I had chosen the sections of scarf to use on the front and back, I thought the rest would be easy. Wrong. I’ve really been struggling with getting the front sections attached to the jacket so that the design is symmetrical. I realized I had better do this before doing any more stitching, because I wasn’t exactly sure where to stop stitching near the edges. Well, it’s a good thing I did stop and align the scarf pieces on the jacket. There were major differences in the two sides. What was so crazy was that, although I had cut the same design portions, when pinned to the jacket, the sections were not the same width! And I had trouble getting them to meet with the back section at the shoulders in any satisfactory way. I can’t tell you how many times I pinned and unpinned, added fusible Pellon to edges that were barely wide enough for stitching and which were fraying (despite having been melted). And then having second thoughts. Is it too wide? Too much? 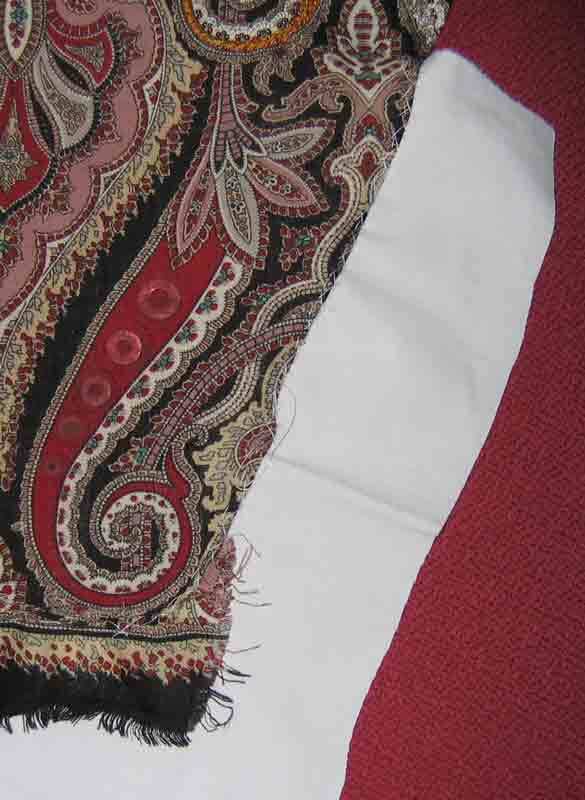 It took a lot of finicky work to get these sections of scarf symmetrical and laying smoothly on the jacket front. Here’s what it looks like, pinned. 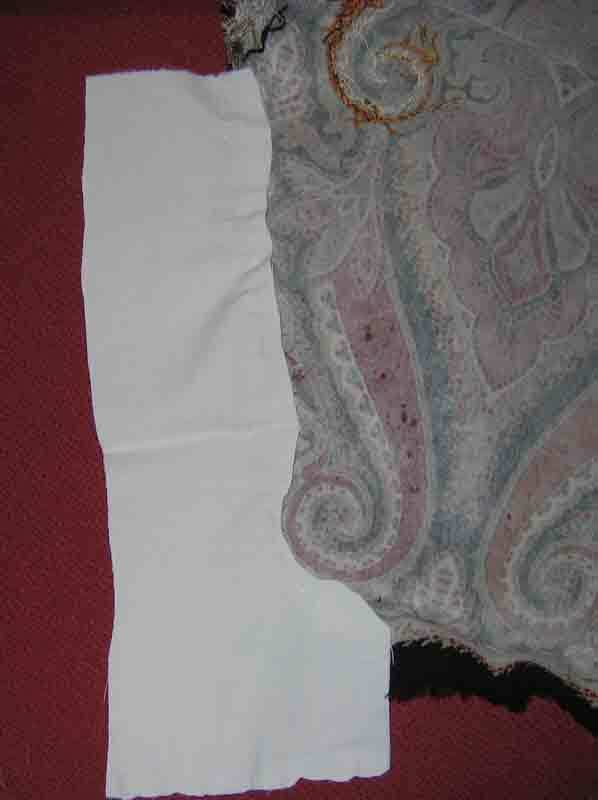 Before doing this exercise, I had already stitched the gold paisley and partially stitched the red one under it on the left in the picture. 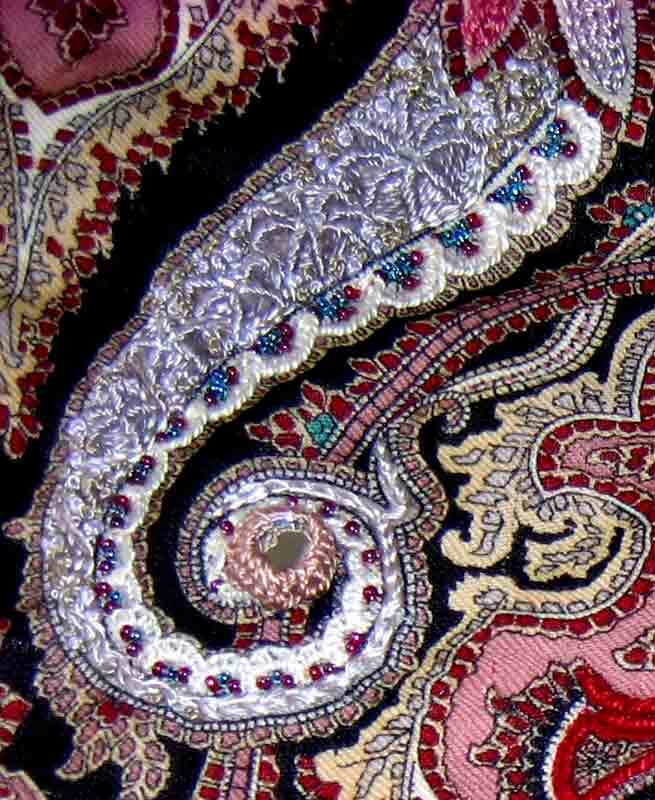 That’s when I discovered that I didn’t know how long the red paisley should be when embellished. I’ll get those bottom curves more even when I stitch them to the jacket. 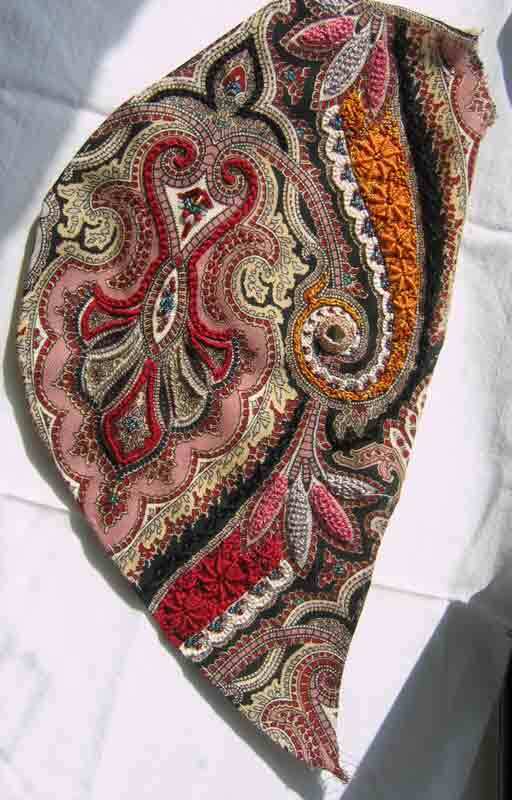 When I wear it, these scarf pieces will not look so large, as they will hang in folds. I put white stitching around all the edges to show me where the piece will be attached to the jacket. By then, I was tired. 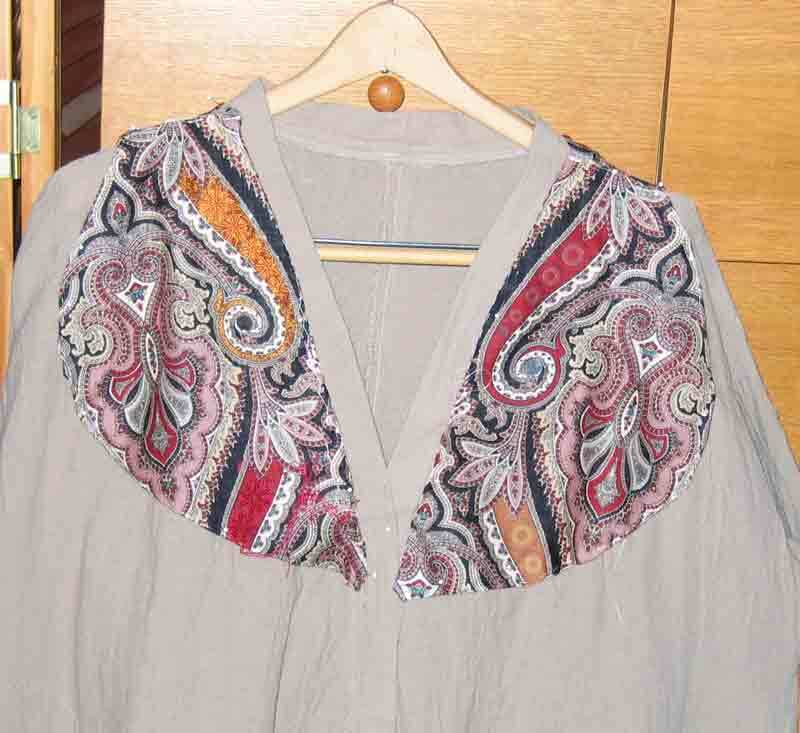 Now I can get back to the fun part–embellishing the design with threads and beads. Still waiting for the LAST order of threads. And still reading about subatomic physics. Got three more books from Mobile Library (formerly Library-on-the-Go, formerly the bookmobile!) yesterday.